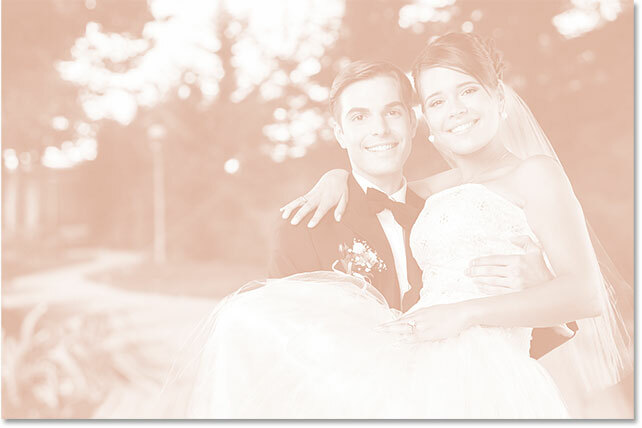 Learn how to easily turn any photo into its own decorative background or border with Photoshop! 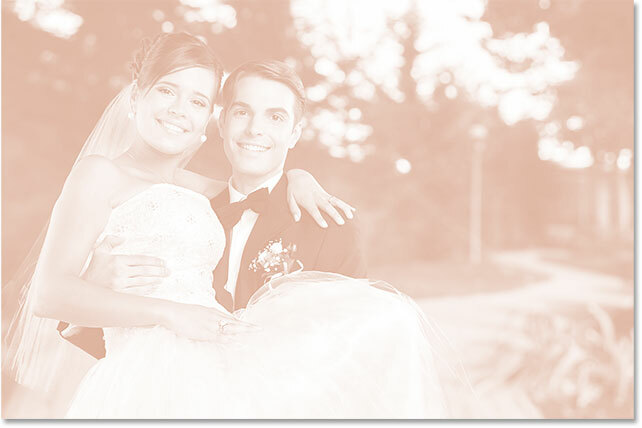 This effect is great for wedding or engagement photos and takes very little time from start to finish. To create the effect, we'll use two separate copies of the photo; one for the main image and one for the background. We'll colorize the background using a color sampled directly from the image, then we'll flip it and fade it into more of a watermark-style effect. We'll then take our main photo, scale it down in size, give it a nice border and shadow, and finally, reposition it into the perfect spot in front of the background. 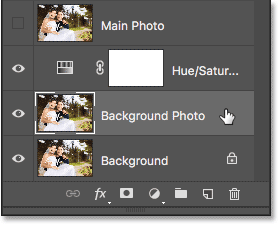 I'll be using Photoshop CC here but this tutorial is also fully compatible with Photoshop CS6. 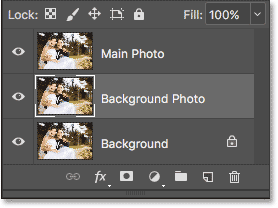 If you're using an earlier version of Photoshop, you'll want to follow along with our original Using A Photo As Its Own Background tutorial. The first thing we need to do is make a couple of copies of the photo. We'll use the first copy for the background and the second copy for the main image. 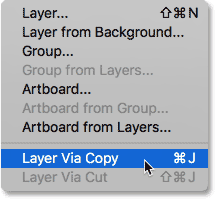 The first copy, named "Layer 1", appears in the Layers panel. 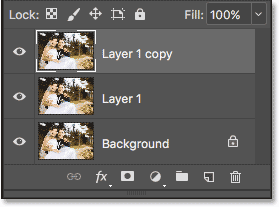 Step 2: Duplicate "Layer 1"
Going again to Layer > New > Layer via Copy. 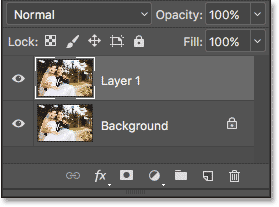 The Layers panel now showing the original Background layer and two copies above it. You may be wondering why we need three layers here when it seems like all we should really need is two; one for the main photo and one for the background. The reason is that the Background layer on the bottom contains our original image information. By leaving the Background layer untouched, we can safely create our effect while keeping the original photo intact in case we ever need it. 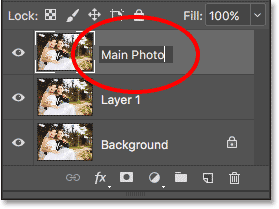 Renaming the top layer "Main Photo". Press Tab to highlight the next layer's name. 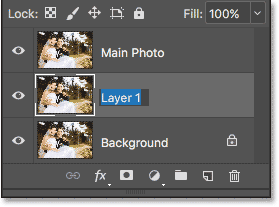 Change the name of "Layer 1" to "Background Photo". 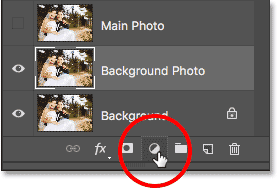 Clicking the visibility icon for the "Main Photo" layer to hide it in the document. 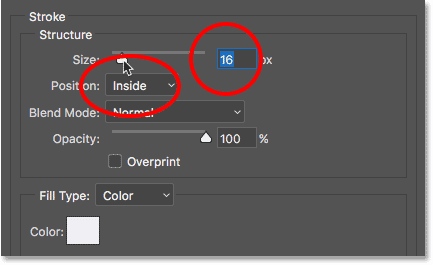 Step 6: Set The Sample Size To "5 x 5 Average"
With the Eyedropper Tool selected, look up in the Options Bar along the top of the screen and you'll find the Sample Size option. 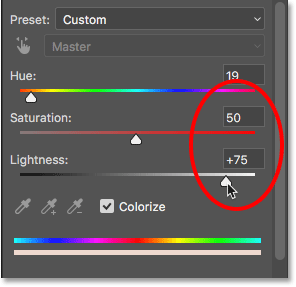 By default, Sample Size is set to Point Sample, which means that when we click on the image to sample a color with the Eyedropper Tool, we'll sample the color only from the specific pixel we clicked on. That's usually too exact for what we need. Rather than sampling the color only from that one specific pixel, it's often better to sample the average color of the spot where we click. Changing Sample Size to "5 x 5 Average". Clicking on the image with the Eyedropper Tool to sample a color. The Foreground color swatch in the Toolbar. 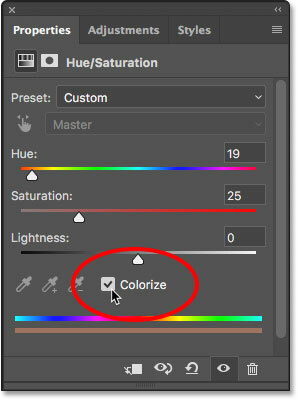 Selecting the "Colorize" option in the Properties panel. Increasing Saturation to 50 and Lightness to +75. 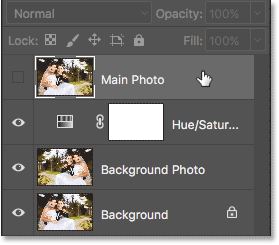 Selecting the "Background Photo" layer. The result after flipping the background photo horizontally. 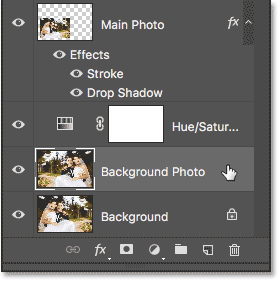 Selecting the "Main Photo" layer. 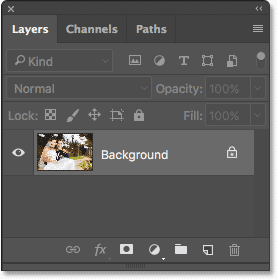 Clicking the visibility icon for the "Main Photo" layer. 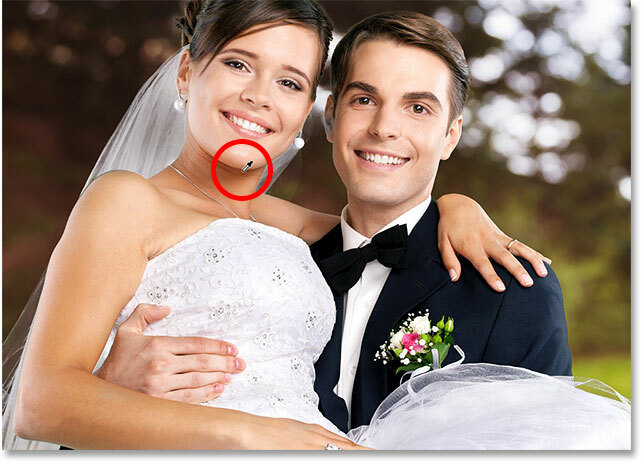 The main photo is once again visible in front of the background. 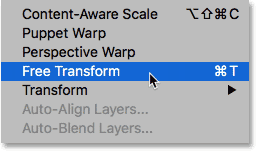 This places Photoshop's Free Transform box and handles around the image. Press and hold Shift+Alt (Win) / Shift+Option (Mac) on your keyboard as you drag any of the corner handles inward to reduce the size of the photo. 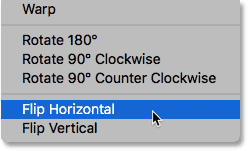 Holding Shift as you drag keeps the original aspect ratio of the image locked in place, while the Alt / Option key tells Photoshop to resize the image from its center rather than from the corner. 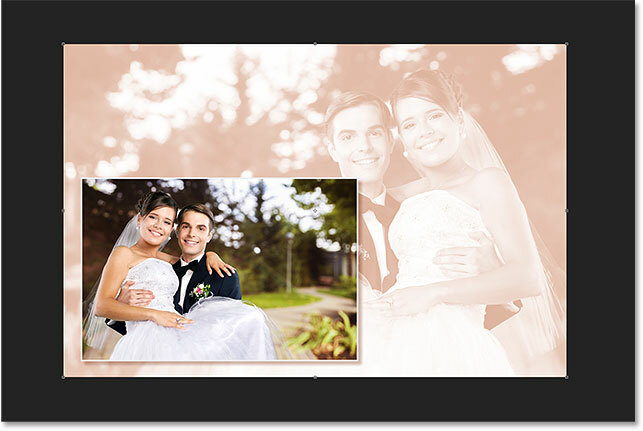 Reducing the size of the main photo using Free Transform. When you're happy with the size of your image, release your mouse button, then release your Shift key and your Alt / Option key. Make sure you release your mouse button first, then the keys, or you'll lose the effect that the keys were having. The result after resizing the main image with Free Transform. 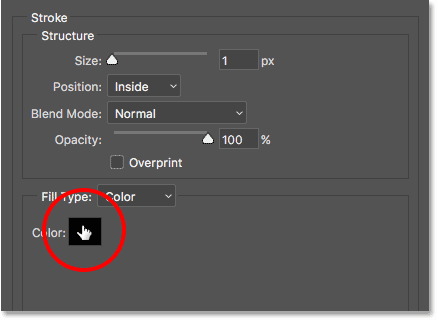 Selecting "Stroke" from the list of layer styles. 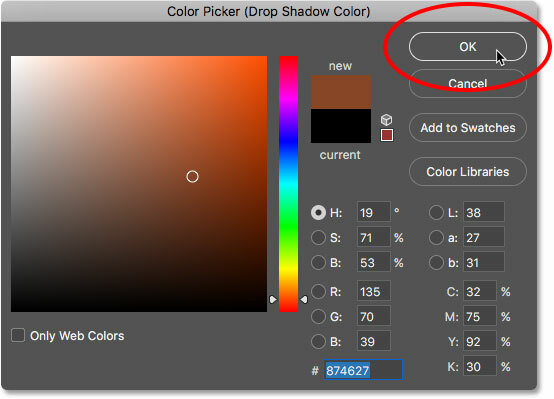 This opens Photoshop's Color Picker. 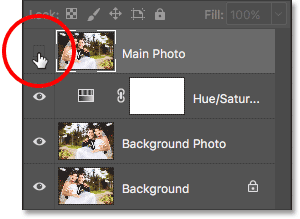 Rather than choosing a color from the Color Picker like we would normally do, move your mouse cursor over the image. 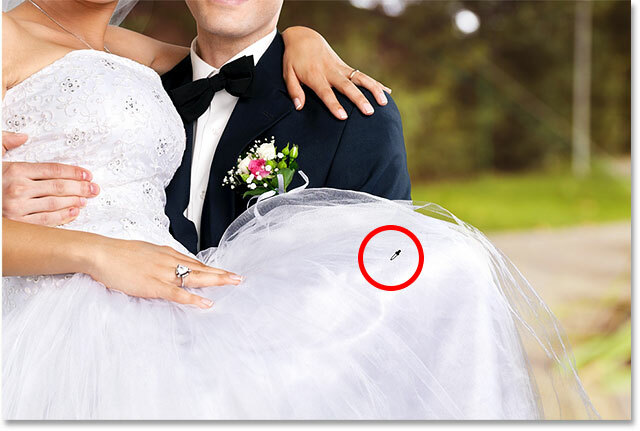 Your cursor will change into an eyedropper icon, just like we saw earlier with the Eyedropper Tool. Sampling a stroke color from the image. 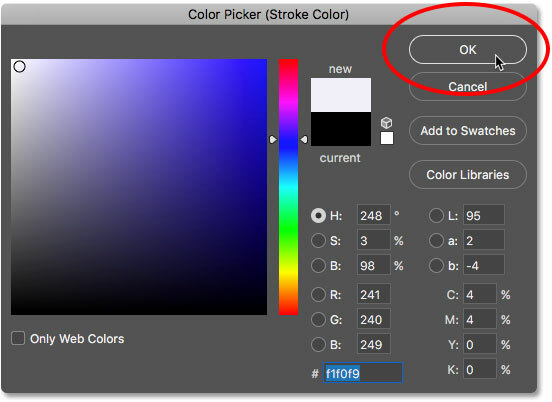 Clicking OK to close the Color Picker. Setting Position to "Inside", then increasing the Size value. The result after adding the stroke around the main image. 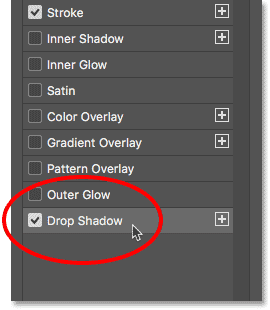 Clicking on the words "Drop Shadow". Clicking the color swatch in the Drop Shadow options. Sampling a darker skin tone to use for the shadow color. 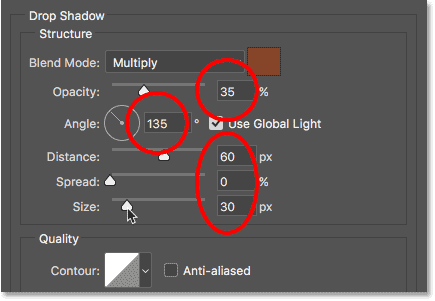 Back in the Layer Style dialog box, leave the Opacity option set to 35% (the default value), but change the Angle to 135° so that the light source appears to be from the upper left. 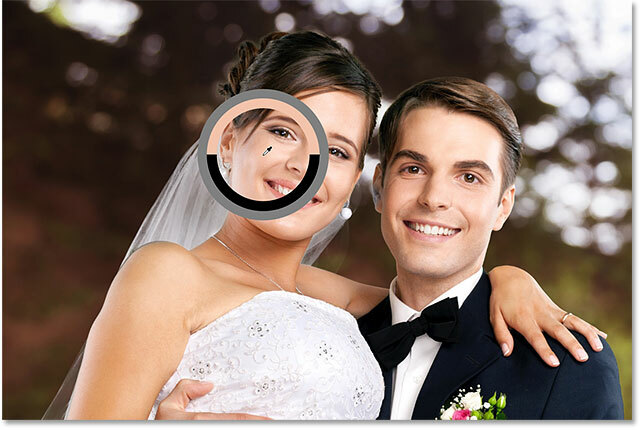 Drag the Distance slider to control how far the shadow extends outward from behind the image. 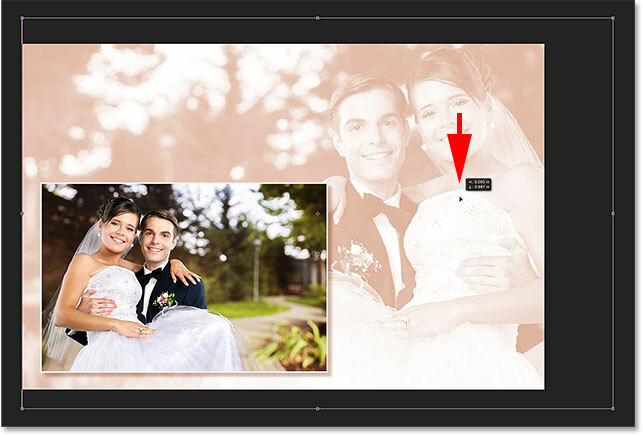 The amount you need will depend on the size of your image, so keep an eye on the document as you drag the slider. For me, a Distance value of around 60 px looks good. The result after applying the stroke and drop shadow to the main image. Dragging the image from the center into the lower left corner. The only remaining problem is that the right side of my main photo is still blocking too much of the couple from view in the background. 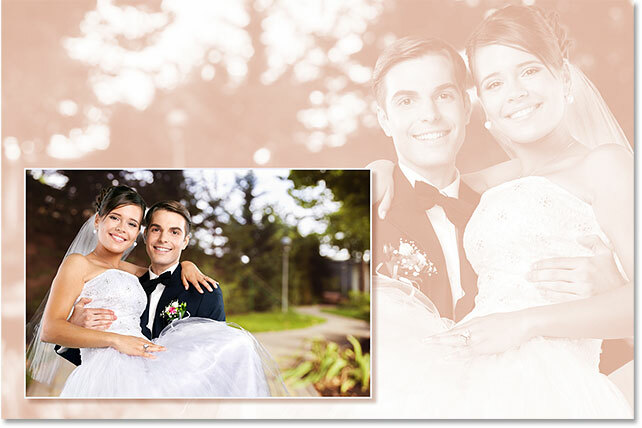 I need to move the couple in the background further to the right, and I can do that by increasing the size of my background photo. Normally we try to avoid making images larger than their original size because it tends to make them look soft and dull. But since this image is being used simply as a background, we can get away with it. Zooming out from the image to see more of the area around the photo. Holding Shift while dragging the top right Free Transform handle outward. 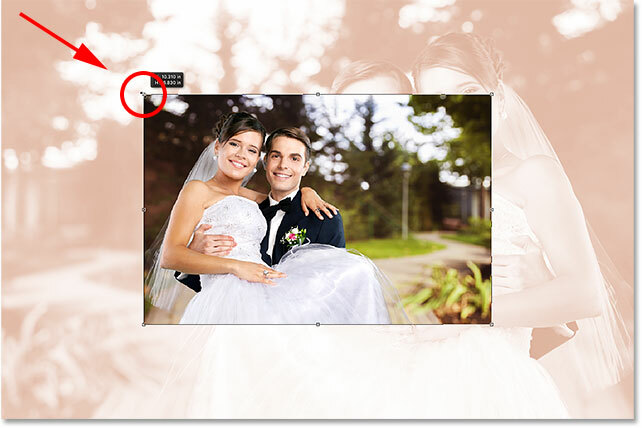 Clicking and dragging inside the Free Transform box to move the background photo downward. And there we have it! 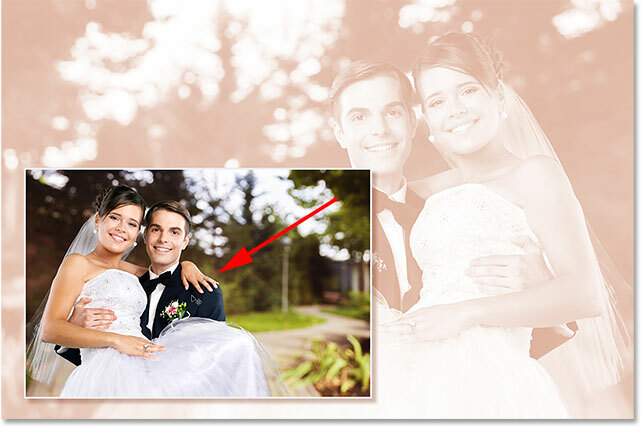 That's how to easily turn a photo into its own decorative background or border with Photoshop! 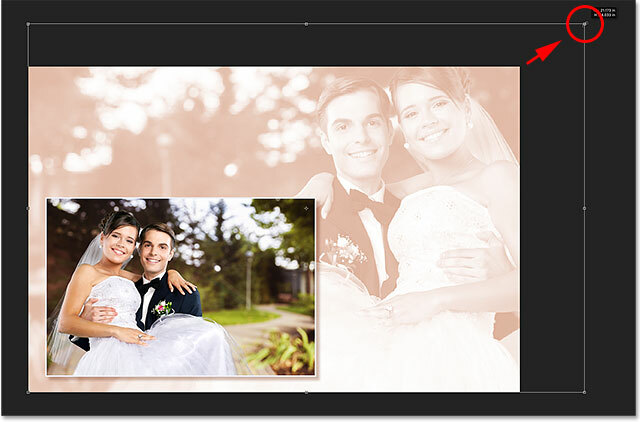 For similar tutorials, check out our Photoshop Borders and Frames section. Or, visit our main Photo Effects section for more Photoshop effects tutorials!